Grantland’s Zach Lowe recently published an extensive piece on Chris Webber’s basketball career – in which he later argued that Webber deserves to be in the Hall of Fame. Unfortunately, his article include several blatant inaccuracies in regards to Sacramento’s 1999 playoff series against the Utah Jazz. 1. Webber did not get into a “shoving match with Malone” in Game 5. The confrontation took place between Karl Malone and Corliss “Big Nasty” Williamson on the Kings’ third possession of the game. Williamson thought Malone threw his left elbow at him on the rebound when the two locked arms (more on this later) and words were exchanged as Williamson refused to let go and Karl tried to break free. Both players received technicals and Greg Ostertag and Vlade Divac even got into a slap-fight as players rushed in to “separate everyone else.” A few possessions later Webber picked up a technical as he was still arguing about Malone’s “elbow.” Utah capitalized on Webber and the Kings’ emotion and roared out to a 16-5 start. 2. Costas and Collins did have that actual exchange about Webber, but it took place in the 2nd-qtr after Webber hit a mid-range jumper over reserve Jazz center Todd Fuller and proceeded to jaw at Fuller as he ran back down the court (can view here at 3:00-mark). Webber never got involved with Malone. Perhaps Zach Lowe simply made an honest mistake here (although neither player bears a striking resemblance to the other), but to those unfamiliar with the actual events of the game – those two “mistakes” would inflate one’s opinion and admiration of Chris Webber and add more intrigue to Lowe’s piece much more than the reality of what transpired. Personally, I do not feel like Chris Webber should be in the Naismith Memorial Basketball Hall-of-Fame. His “peak” years contained numerous injury issues (in which the Kings actually posted winning percentage’s that were nearly equal to when he played), lacked a signature individual postseason performance and climaxed in just one conference finals appearance. I believe the attraction to send Webber to Springfield stems from the attraction many had to Webber during his playing career: The guy was one of the most physically gifted bigs to ever play the game. At 6-10 he had unbelievable hands and could pass, handle, shoot, post-up and run like very few others. He may not have met everyone’s lofty expectations, but he turned that skillset into a very successful professional career. He had a very good NBA career, just not a Hall-of-Fame one. Fortunately for Lowe and Webber, in today’s society that awards trophies for participation and sparks HOF debates for virtually everyone in an effort to drum up ratings (see Jeff Van Gundy’s impassioned plea during the NBA Finals that Tracy McGrady is a HOFer), it won’t surprise me one bit to see C-Webb in Springfield one day. Back to the ’99 Kings/Jazz series. The Kings had a strategy that was as clear as Jon Barry’s nose. It was their plan to “lock” Malone up with non-basketball plays in hopes that something beneficial/violent would occur as Malone tried to break free. It occurred earlier in the regular season during a Rockets/Jazz game when Houston reserve forward Othella Harrington grabbed Malone from behind as he was running down-court. Malone’s response was to turn around and hit Harrington in the face – a move which earned him a flagrant foul and a suspension for the subsequent game. In Game 3, Webber tried to bear-hug Karl as Malone went up for a rebound. With his superior strength, Malone threw Webber to the floor like a rag doll and Webber landed with a thud. The raucous Kings fans booed in outrage as if Malone were the guilty party – and the referees agreed and awarded Malone with a critical 3rd-foul that sent him to the bench for the remainder of the half. This was a key moment in an eventual Kings’ overtime win. That alone was not an isolated incident. In the 4th-qtr of Game 4, Vlade Divac latched onto Malone’s arm on a rebound – and again Karl threw Vlade to the ground. This time it backfired on Sacramento as the referees (thankfully) didn’t take the bait and Utah scored the go-ahead basket in transition with Vlade still on the floor [Can watch here at the 22:02-minute mark). The Malone/Williamson incident to open Game 5 was actually the third time the Kings tried that tactic and did not involve Webber. Additionally, it needs to be said more often that Chris Webber’s “hard foul” on Stockton to open Game 2 rivals any Karl Malone elbow in terms of cheapness and maliciousness. Although it says a lot about the success of Sacramento’s franchise that this has somehow become a seminal moment in their team’s history (conversely as big a Malone-homer as I am, I feel Malone’s elbow on David Robinson in ’98 was one of the most shameful plays of his career) – not only was it premeditated by Webber but it played a significant role in Stockton&Malone never winning a championship in the season that was thought to be their best chance. After the hit Stockton was never the same player for the rest of the postseason and in the offseason required what was called “undisclosed” surgery. Normally Stock would bounce right up after a fall, but this time Stockton stayed down, and stayed down for awhile. Slowly he got to his knees and stayed there momentarily before gingerly getting to his feet. Dennis Rodman was suspended for a ’94 playoff game for a leg-whip on Stockton (as well as under-cutting Tom Chambers) and Webber’s blow was as bush-league as that. Not only did Jerry Sloan want to fight Chris Webber immediately after the cheapshot, but later when asked why he thought Webber wanted to hit Stockton, Sloan’s response was because he wasn’t man enough to hit Karl Malone. The other noteworthy Chris Webber footnote that Lowe failed to bring up from that ’99 series was the disappearing act Webber made late in those games. 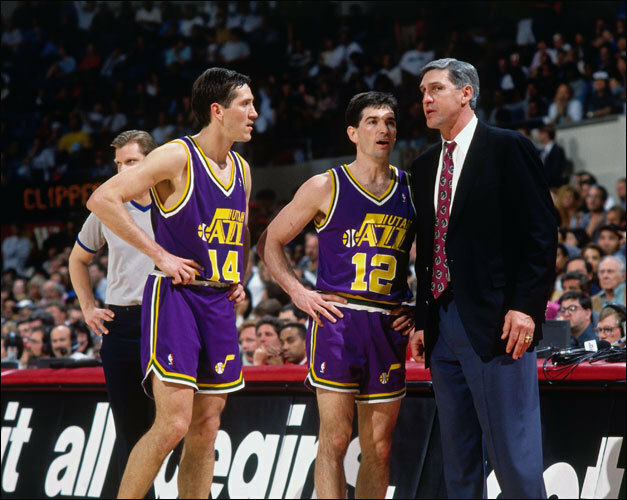 The play of Utah’s centers was atrocious, and in the 4th-quarters of their victories in Games 4&5, Jerry Sloan opted to play Malone at center and Bryon Russell at power forward. Although Russell did play PF in college at Long Beach State, he should have been no match for Webber yet he defended Webber to a standstill – fronting Webber in the post and slapping the ball away as he went up to take a shot. On the few times Webber did get inside, Russell sent him to the line where Webber shot a horrendous percentage (45% in the regular season and 40% in the playoffs). That the Kings remained in those games at all was largely due to the play of Vlade Divac (who in ’99 was their go-to post-up option in crunchtime over Webber) and Vernon Maxwell and Jon Barry. The ’99 Kings/Jazz matchup was one of the best first-round series in NBA history, featuring dramatic finishes and physical play taking place inside the two loudest buildings (Arco Arena vs Delta Center) in the NBA. 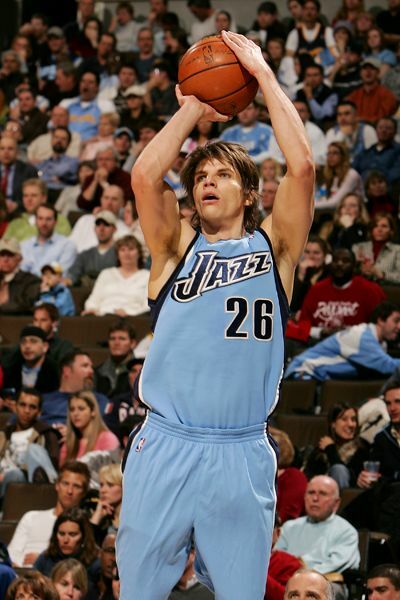 If you’re a Jazz fan or merely an NBA fan who appreciates the history of the league, it’s definitely a series you should be aware of – just make sure the facts you know are the correct ones.